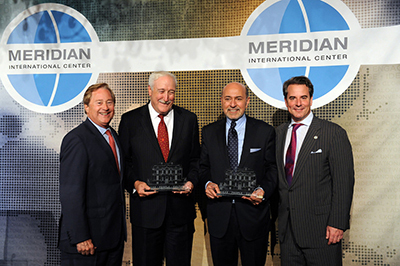 On Tuesday, June 10, 2014, Washington’s top government and corporate leaders, along with countless international leaders, convened for the Meridian Global Leadership Awards to honor two distinguished leaders - M. Shafik Gabr, Chairman and Managing Director of ARTOC Group for Investment and Development, who received this year’s Meridian Global Citizen Award and Sean O’Keefe, former Chairman and Chief Executive Officer of Airbus Group, Inc., recipient of the Meridian Corporate Leader Award. Held at the Four Seasons Hotel in Georgetown and chaired by Secretary Ray LaHood, Senior Policy Advisor, DLA Piper and Former U.S. Department of Transportation Secretary, the Meridian Global Leadership Awards reception and dinner were attended by members of the diplomatic and congressional communities, international and domestic policy-makers, CEOs of multi-national corporations, and prominent media figures. High profile figures included - Former President of the Czech Republic, His Excellency Václav Klaus; Former President of the Republic of Colombia, His Excellency Andrés Pastrana Arango; Congressman Darrell Issa (R-CA); Congressman Nick J. Rahall (D-WV); Congressman Thomas Petri (R-WI); Congressman Dutch Ruppersberger (D-MD); and Ambassador of the Arab Republic of Egypt to the U.S., His Excellency Mohamed Tawfik. M. Shafik Gabr, Chairman and Managing Director, ARTOC Group for Investment and Development, was awarded the Meridian Global Citizen Award for his work, and that of the Shafik Gabr Foundation, in cultural diplomacy and commitment to building bridges of understanding between the Middle East, the U.S., and around the world. Mr. Gabr, an international business leader, philanthropist, and one of the world’s leading collectors of Orientalist art, was introduced by Secretary Ray LaHood, Senior Policy Advisor, DLA Piper and Former U.S. Department of Transportation Secretary. The Honorable Sean O’Keefe, former Chairman and Chief Executive Officer of Airbus Group, Inc., received the Meridian Corporate Leader Award for his leadership at NASA and the U.S. Navy, dedication to corporate citizenship at Airbus, and commitment to empowering the next generation through leadership in higher education. Regarded as a global leader in the aerospace and defense industry, Mr. O’Keefe was presented with his award by Ambassador Stuart W. Holliday, President & CEO of Meridian International Center.